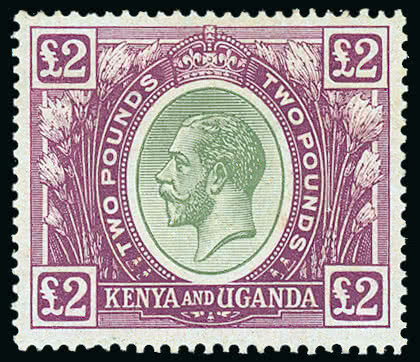 542 Kenya, Uganda and Tanganyika: Kenya and Uganda: 1922-27 Watermark Mult. Script CA 2s. dull purple, variety watermark Crown to right of CA mint, minor gum crease, also 4s. grey with watermark Crown to right of CA fiscally used, fine. S.G. 88w, 91w. 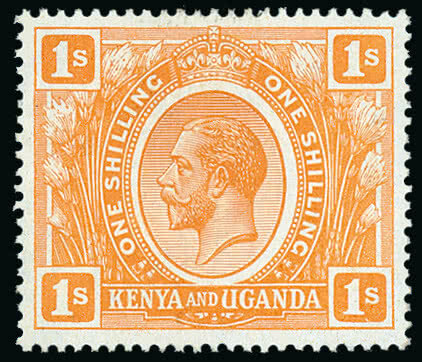 543 Kenya, Uganda and Tanganyika: Kenya and Uganda: 1922-27 Watermark Mult. Script CA 10s. 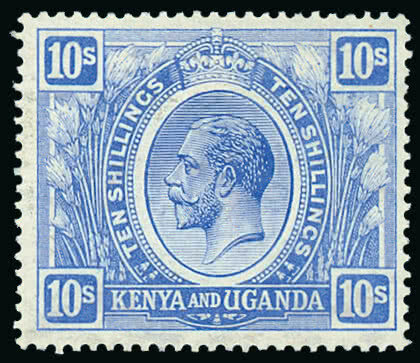 bright blue, variety watermark Crown to right of CA mint, gum crease, otherwise fine. S.G. 94w, cat. £550. Photo. 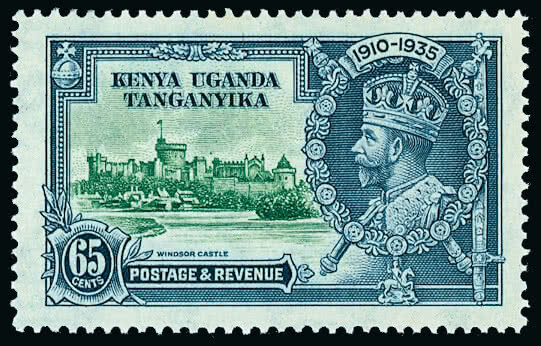 547 Kenya, Uganda & Tanganyika: 1935 Silver Jubilee 65c. showing ‘dot to left of chapel’ [Pl. 2B, R. 8/3] mint, also normal 20c., 30c. and 1s. for comparison, lightly toned gum, otherwise fine, and 1938-54 50c. purple and black perf. 13 x 113/4 with rope not joined to sail in an upper marginal block of four, mounted in margin only, gum toning, otherwise fine. S.G. 126g, 144, a, cat. £894. Photo. 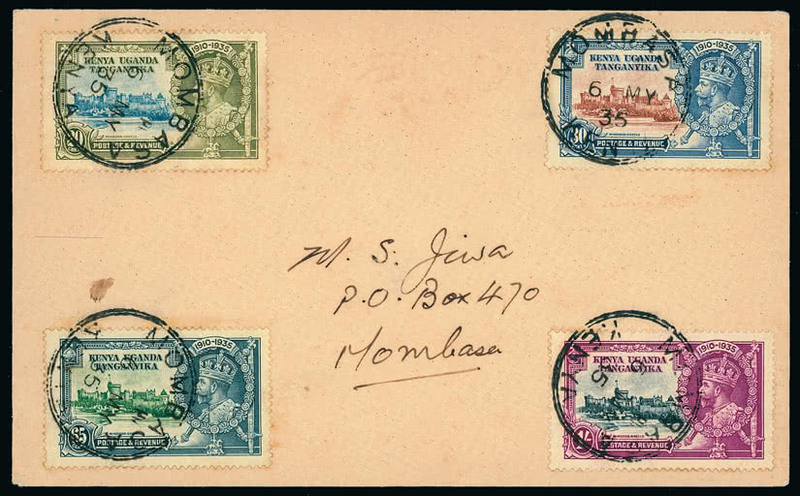 549 Unmounted Kenya, Uganda and Tanganyika: 1938-54 perf. 131/4 x 133/4 1c. black and chocolate-brown complete sheet (folded without sheet margins at top and right) plate “2 2 4A” with varieties retouched value tablet [R. 9/6], and “C” missing in “CA” watermark on [10/2, unlisted], fine. S.G. 131, ad, var. 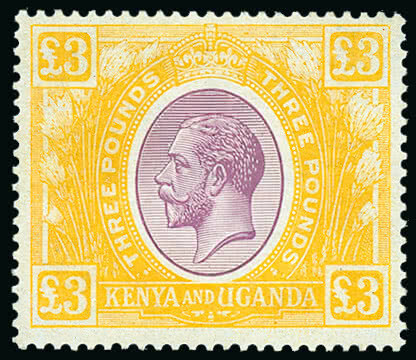 550 Unmounted Kenya, Uganda and Tanganyika: 1938-54 perf. 131/4 x 133/4 1c. black and chocolate-brown complete sheet (folded without sheet margins at top and right) plate “2 2 4A” with varieties retouched value tablet [R. 9/6], and “C” missing in “CA” watermark on [10/2, unlisted], a few minor tone spots, otherwise fine. S.G. 131, ad, var. 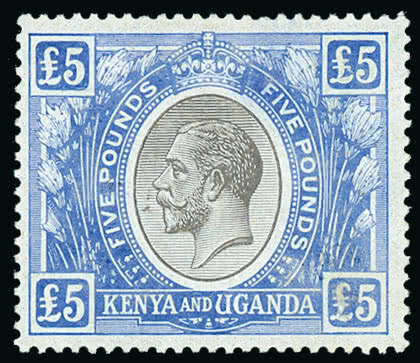 551 Unmounted Kenya, Uganda and Tanganyika: 1938-54 perf. 131/4 x 133/4 1c. black and chocolate-brown complete sheet (folded without sheet margins at top and right) plate “2 5A” with variety retouched value tablet [R. 9/6], also 1c. black and chocolate-brown complete sheet (folded without sheet margins at top and right) plate “2 2 4A” with variety retouched value tablet [R. 9/6], 1c. three imprint blocks of eight, each with retouched value tablet [9/6], shades, mainly fine unmounted mint. S.G. 131, ad. 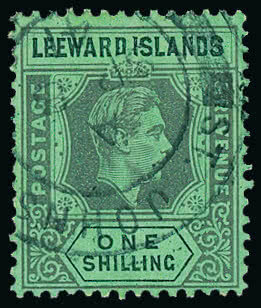 559 / Used / Leeward Islands: 1938-51 1s. black on emerald with “DI” flaw, fine used. S.G. 110a, cat. £400. Photo. 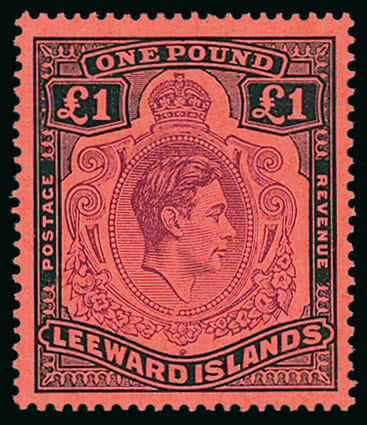 560 Leeward Islands: 1938-51 £1 brown-purple and black on salmon showing missing pearl variety [HPF 49b], lightly hinged, fine. S.G. 114ba, cat. £1,700. Photo.